For a free copy of this book (there is even a Kindle version available!) CLICK HERE. I am only halfway through reading it and my thoughts about teaching have been challenged, I have been inspired, and I have agreed with many, many points that Seth Godin makes. I am not ready to make a full summary or synopsis of my thoughts since I am not done reading it yet but I do know that If I want to make change in any education system (here in Korea, or the Philippines—where my heart has always been) I need to think about most of the points that Godin brings up in this manifesto. 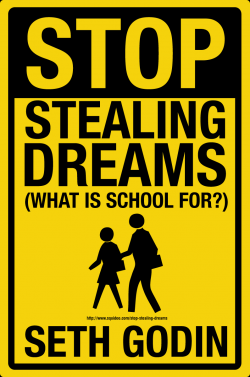 February 4, 2013 melody	free book, seth godin, stop stealing dreams, what is school for? Exactly. I haven’t read this book, but my expectations and thinking have completely changed since I started homeschooling last fall. Sounds like an intriguing book. I’ve been looking into homeschooling and this might be a good read for me.